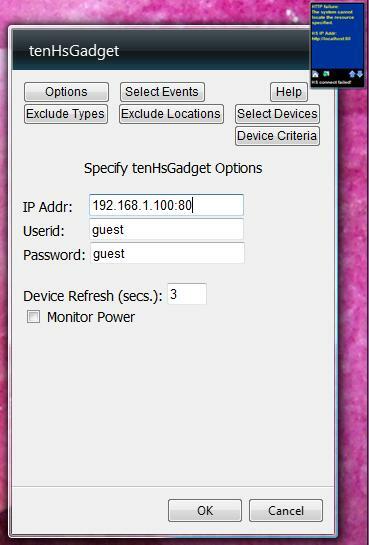 tenHsGadget consists of a server program (tenHsServer) that runs on your Homeseer server computer, and the Vista Sidebar Gadget (tenHsGadget) that runs on your Vista client computer. Both must be installed by downloading and running their setup programs. First, download and run the tenHsServer setup program on your Homeseer computer. It is located here. The setup program will install the files into the correct Homeseer folders. Next, download and run the tenHsGadget setup program on your Vista client computer. It is located here. (Version 1.1.2 4/1/2008). This setup program will copy the Sidebar Gadget file to your Program Files\tenWare\tenHsGadget folder. It will then prompt you to install the gadget into the Vista Sidebar. If you choose not to install it now, you can always intall or reinstall it later from the Start button at: Start/Programs/tenWare/tenHsGadget. The first thing that tenHsGadget does is connect to your Homeseer server. This requires tenHsGadget to know where your server is located. If this is the first time that you have installed tenHsServer, then you will be presented with an error indicating connection to Homeseer failed. You now must specify the location of your Homeseer web server by specifying the IP address and TCP port that Homeseer is using. To do this, click on the wrench icon at the top right of the gadget to open the Options panel. Then, click OK. tenHsGadget will again attempt to connect to Homeseer. If it times out, you will once again see the error messages above. You should now see the Device List display. There will be no Devices listed because you have not yet selected which devices you want to see in the Device List. You should see a Select a Device button that appears whenever there are no Devices to display. You can click it if you want to view the Device Flyout. Select any Location and Device to view its current status and/or control it. Click the icon to display the Event List. There will be no Events displayed yet because you have not yet selected any Events to display. Click the icon to display the Devices List. You are now ready to proceed to Initial Setup.